Back in 1972 when I worked at the Jane Hodge Holiday Home, we took a party of youngsters out in our bus to a location a colleague called Pontneathvaughan. Nowadays this is usually known by its correct name of Pont Nedd Fechan and is a mecca for those that love the Vale of Neath and “Waterfall Country”. Our destination that afternoon was Dinas Rock where just managed to squeeze our bus across the narrow bridge into the car park. We had decided on this location as my colleague had said there was a nice walk alongside the river and as we had a mostly ambulant group of youngsters staying with us that week we decided to visit. After disembarking from the bus we walked along the old track bed of the tramway alongside the Afon Sychryd, those with knowledge of the area will know exactly where I mean, until we came to the end of the riverside track and here is where I missed a photographic opportunity which could never be repeated, a picture of the incline up the waterfall to the next level. Although missing a few cross planks in places the incline was basically intact and could have been used. At the time I didn’t realise the industrial archaeological significance of this feature, nor did I know of the interest I’d have in the area in later life, so a photographic record was unfortunately not made, something for which I could kick myself now. So this then is the only poor photo I have of that mini-expedition with the youngsters, and shows a few of them by the riverside somewhere along the section from the car park to the waterfall. I can usually date my old slides taken at the holiday home to within a 12-day period, but on this occasion can be precise, Sunday 16th April 1972. It’s a transparency taken on Kodachrome 64 film with my Practica Super TL camera. 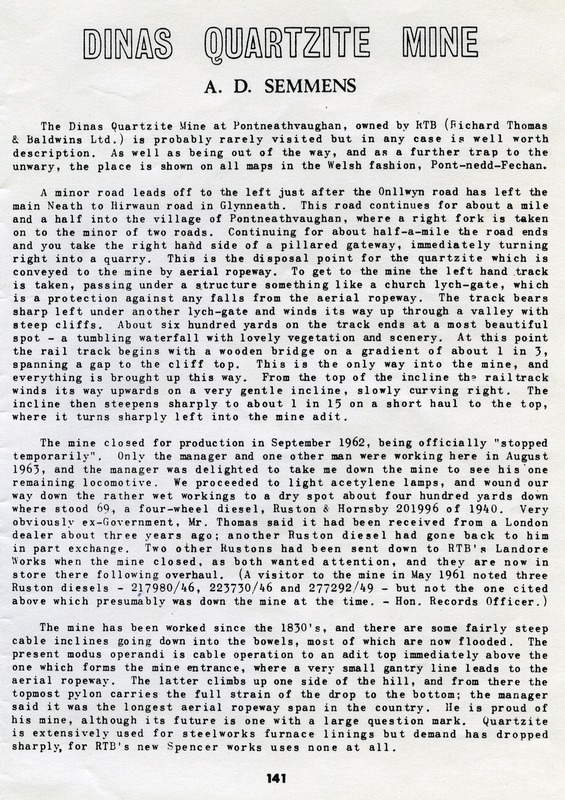 The following is a photocopy of a report first published in the journal of the Industrial Railway Society in 1963, which describes the area at that time. Unfortunately there were no photographs of that visit. Click to enlarge. Below is a photograph of Dinas Rock which appeared in a school text book published in 1908 by the Educational Publishing Company Limited, Trade Street, Cardiff: The Story of Glamorgan by C J Evans. In the foreground can be seen the tramway which followed the contour of the river up to the silica workings.